The Retail Manager Resume Template presents the information required on a Retail Manager Resume in a stream lined and attractive format. Retail Managers must make sure they can show off their leadership skills as well as their knowledge of customer relations in a variety of situations in addition to a host of other skills. 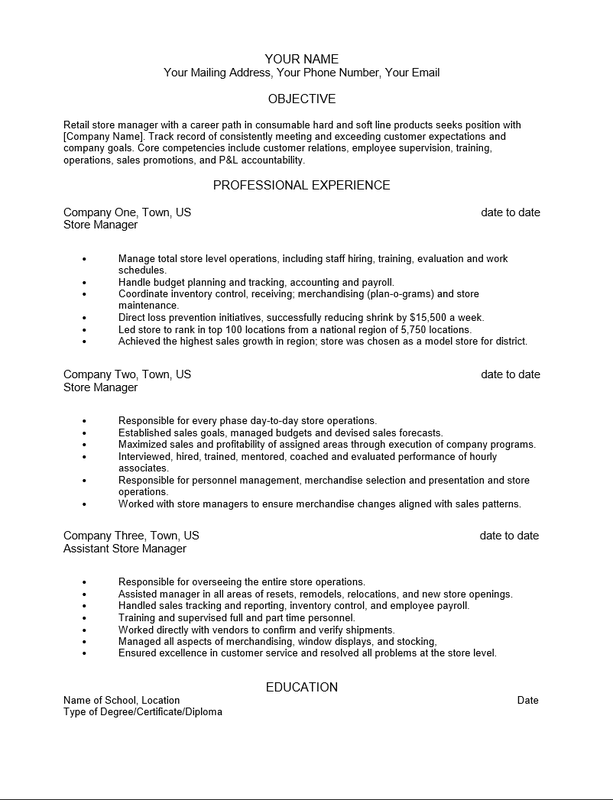 The Retail Manager Resume Template contains a set format of several sections which may be filled out by the applicant. Step 1. Enter the name and contact information you wish the potential employer to use. This should be up-to-date current information and should be centered at the top of the page. It can be aligned to the side of the page however, it is generally standard to have this information centered. Step 2. Write a statement about your intentions, abilities, and/or how you would function in the position you are applying to. It would be a good idea to include the company name if possible. Place this content in the “Objective” section. Step 3. Gather your information for the “Professional Experience” section. This section will be a listing of entries. Each entry will be a place where you were employed and should be placed in descending chronological order. The first line of each entry will be the Name, Location, and employment Date range of the company where you worked. The next line should be the job title you held. The following lines of each entry should have a description of your duties or achievements while employed there. Step 4. In the “Education” section report the institutions or trades schools where you earned a degree, diploma, or certificate. This should include the name of the school,location, date of graduation or program completion, and type of degree or certificate gained.